Why A Large Quantity iPad Rental? Renting a large quantity of iPads is a a great option if you need to put a lot of mobile devices in the hands of a lot of employees, for a temporary amount of time. For example, if your company is preparing to conduct a large project that requires your employees to keep track of information and stay networked with each other, it makes sense to rent the technology rather than buy it for such an ephemeral need. The kinds of projects that large quantity rentals are usually used for include Computer Training, Software Evaluation, Customer Survey Product Demo, or Inventory Projects. A large amount of iPads needs the right kind of supporting technology that can keep them running and network them with each other and to the internet. Our Tech Travel Agents can get you any technology you might need to support your large quantity iPad rental, which might include wireless bridges, routers and network servers. We can offer top brands such as Cisco, Bradford Networks, Dell, HP, Juniper Networks and Alcatel-Lucent. 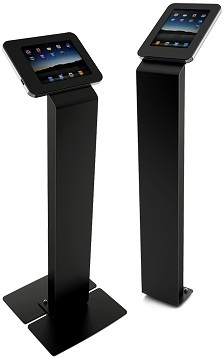 If you need to set up a lot of kiosks at an event, there's no better solution than a Large Quantity Tablet Rental. With the appropriate locks and kiosk stands, you can procure up to 1000 tablets or iPads with just one phone call to a Tech Travel Agent, and have them all delivered and set up!